This section shows you how to add a portlet/gadget to the Applications list on the left panel of the Manage Applications page. Click Portlet/Gadget on the Tab bar to open a list of portlets/gadgets respectively. Left panel : The list of portlets/gadget. Right panel : The information of the portlet/gadget. Breadcrumb bar : The path of the portlet/gadget. Click the portlet/gadget which you want to add to the Applications list. The information of the portlet/gadget is displayed. 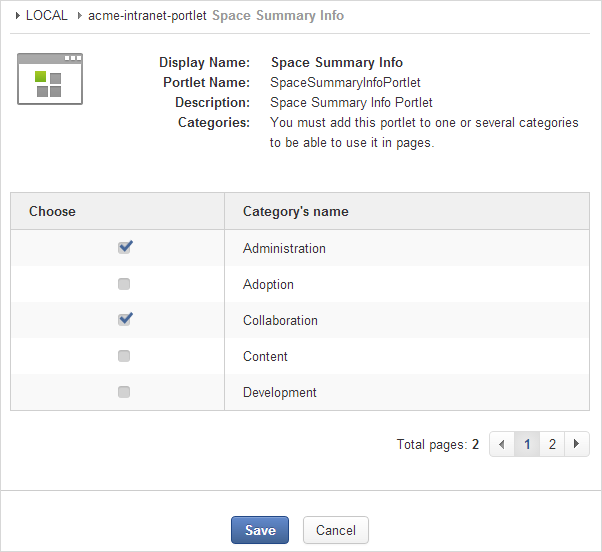 Click the Click here to add into categories link to open a form which allows you to select categories for the portlet. Select your desired categories and click Save to accept adding the portlet/gadget to the Applications list. Then, you will see the list of categories to which the portlet/gadget is added. In case the portlet/gadget was already added to the Applications list, there is no the Click here to add into categories link.